It’s been said and often repeated by just about every successful marketer out there that the biggest money comes from having your own product. Reason being that when the product is entirely yours, you’re not sharing profits or splitting revenue with anyone else. All the money goes directly to you. You decide your price point and your name goes on the product. What makes having your own product especially powerful is building your brand and trust among your audience while gaining a list of real buyers instead of primarily freebie seekers. Many big bloggers and marketers have created their own ebooks and courses, selling them at a premium price. Despite the relatively high prices of their products, their audience goes bananas over these products for one very specific reason; they trust the author/marketer/blogger. That’s the result and reward that comes with building your name in your market. And as your audience enjoys your content and finds it helpful, they will continue purchasing more products from you. Google specifically has stated that the purpose of all content should be to help people solve problems and find solutions. If you’re such a marketer who can create products that your audience will find helpful, your audience will stay loyal to you. And at the same time, your brand and stock rises. Everyone wins in the end and you’re singing to the bank. 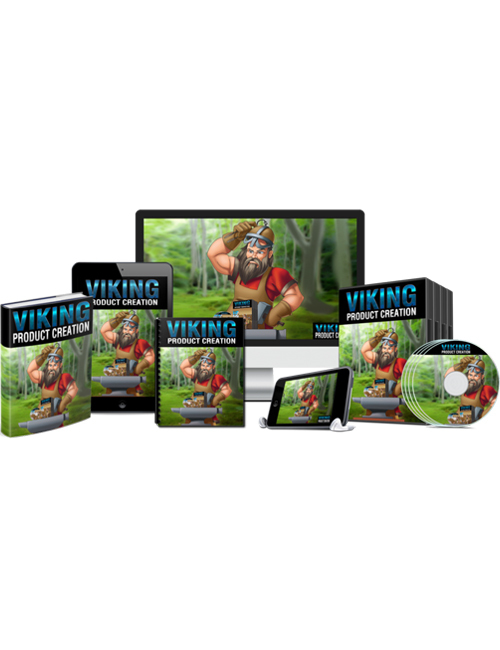 Viking Product Creation goes deep into exactly how to go about with your own product creation. You’ll also learn about bringing JV partners and affiliates on board to reach an even wider audience and make even more profits with your product. As always, you get a massive pack of awesome tools to go with it including lead magnets, audio and video training, Facebook ads, graphics, Powerpoint slides, emails, and a tutorial to help you rebrand it all under your name. When you’re ready, go for it.